An old friend of mine, Joseph Goldstone, is an expert on the rendition of color in the context of film production. He came to me with an unusual proposition: he was building a mechanism to help production companies test the reproduction accuracy of their film printing pipelines, and could I help out with some custom sensor development? In order to make his rig approachable by the production folks, he was building the rig out of Lego, and needed to make some custom sensors and beef up the rig here and there. Sounded like great fun. It turns out that a lot of the films we view in theaters are still printed onto 35mm film stock for projection. More and more production, though, is purely digital. Color rendition on the film stock is not exact, and there is often a costly and time-consuming dance of color correction so that the film prints look the way they should. The rig we were building did an exhaustive characterization of the production pipeline so the color correction could be pre-applied. For the whole color space, it did a "this is what you asked for…this is what you got" analysis, so that one could do a "this is what you want, this is what you should ask for" beforehand. This characterization is not a quick or simple process. Many color swatches must be analyzed, and they must be unerringly presented to a laboratory colorimeter. 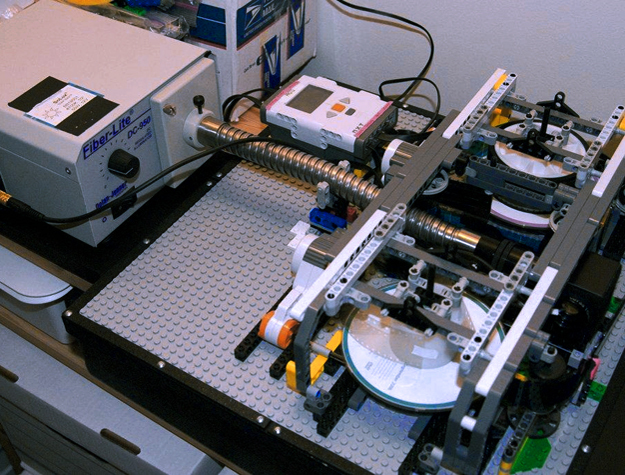 The Lego rig was the transport for this process…a slow and steady film projector, if you will. Custom Lego bricks were developed with an IR optointerrupter for the NXT controller. Coupled with a handful of other laser cut and machined parts, we were able to bridge the gap between Lego and the 35mm film transport hardware (hubs, sprockets, etc.). These sensors are useful for many other Lego projects – they can be purchased from the author. Drop me an email.